I've posted about the NYC BigApps contest a few times here. And you all helped me with my chore of judging all 85 apps. Thank you for that. Last night I walked up The Highline to IAC Headquarters to attend an event where the winners were announced. I also manned the "Investors Bar" where a number of fellow venture and angel investors sat and talked to the entrepreneurs in attendance. Kind of like the genius bar, but the geniuses were on the other side lining up to talk to us. WayFinder NYC: An application designed for smartphones powered by Google’s Android operating system allows users to find the closest subway entrance. It uses an approach known as augmented reality, overlaying subway line symbols on a live view through the phone’s camera. Taxihack: Like Yelp for cabs, this Web tool allows people to post comments on individual taxis and their drivers via e-mail or Twitter. Big Apple Ed: This Web-based guide offers detailed profiles, reviews and information about the city’s network of public schools. NYC Way that offers a range of information for city residents and visitors, took home the “Popular Choice” award, determined by an online vote. I use Wayfinder on my Google phone. It is a very cool app that combines mapping and augmented reality to get you to the nearest subway. I also really like Taxihack. You can email or twitter about your cab driver right from the cab. Two other "apps" that I liked very much which got honorable mentions but no awards were Actuatr and Push Pin Web. These are both developer tools which make the often messy data from government agencies much easier to develop apps with. Better tools will lead to better apps. I got to meet the teams behind ParkShark, PrimoSpot, Taxihack, NYC Way, UpNext, NYCPRO, HistoryBus, NYCSamosa, SpokesNYC, and a few more that I can't recall. It was a bit crazy at the Investor Bar last night. I also came home with my android phone stocked full of mobile apps like PrimoSpot and Always Prompt, both of which I bought last night and am looking forward to using to help me with the daily grind. 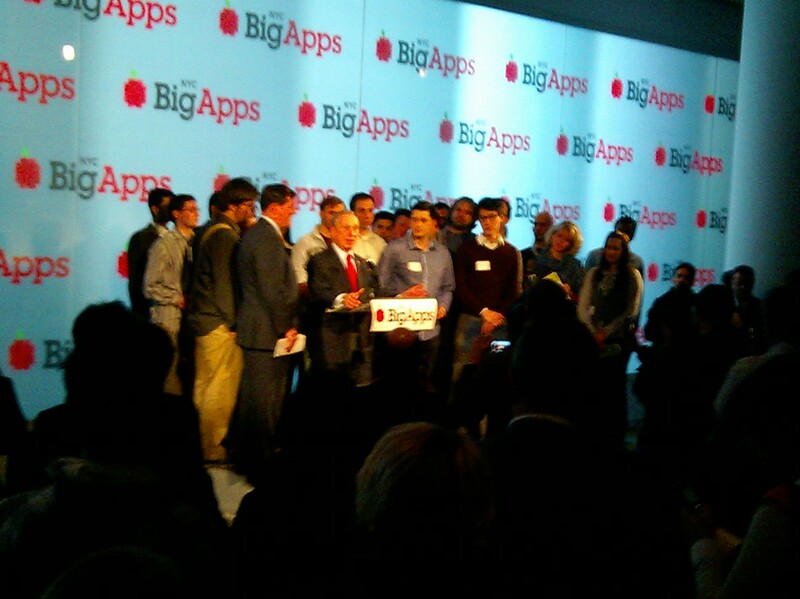 Finally, I'd like to say that it was a thrill to see the mayor up there on stage with NYC entrepreneurs. He's the most successful tech entrepreneur in NYC but we don't see him very much in the tech scene. We need more role models, as I talked about here, and he's the best we've got in NYC. I hope he spends more time with us this term.